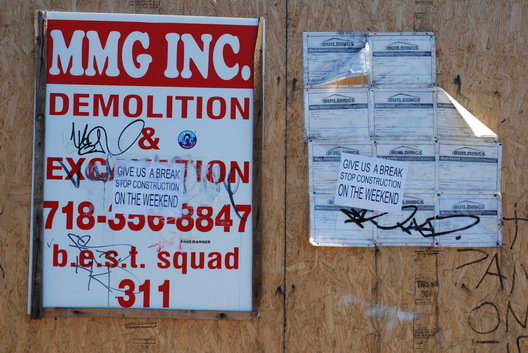 These signs have been pasted up outside the former site of the Manhattan Chocolate building at 580 Union Avenue in Williamsburg, which is in the process of becoming a condo. The firm that tore down the old building is the same one involved in the tear down of 5 Roebling, aka the Giant Fart Cloud Building, which was hit by a Stop Work Order after some drama. 1. There is no such address as 580 Union Avenue. It is 544 Union Avenue. 2. 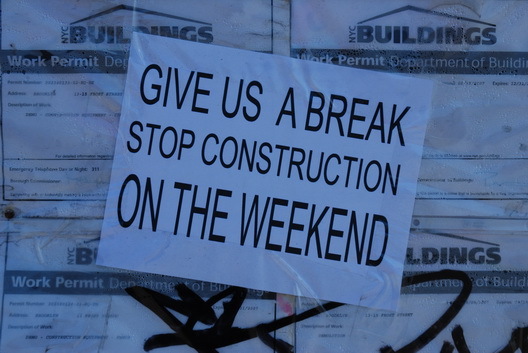 When has there been weekend work at this site? I live near the site on Whithers Street and have never seen any weekend work at this site. 3. You may think the stickers are funny, but the police should arrest the person who put them up for vandalizing the property.